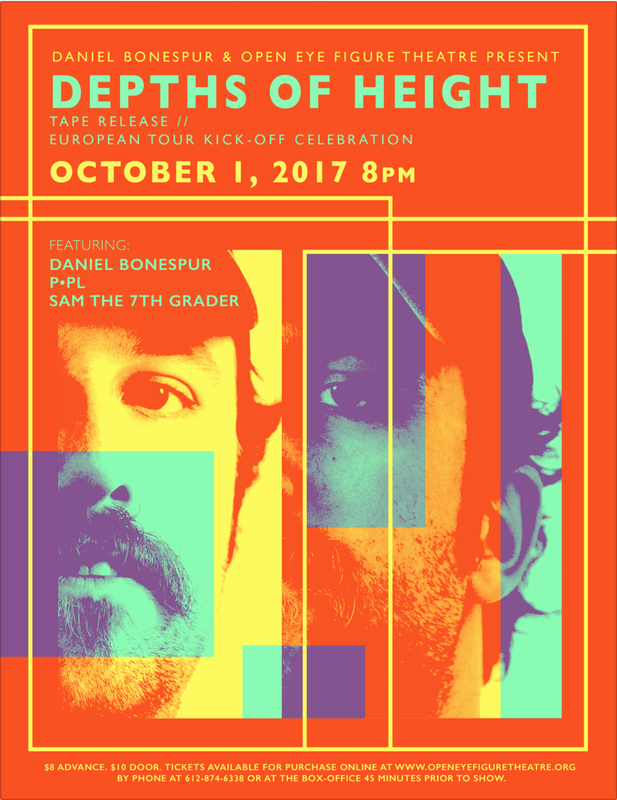 Daniel Bonespur, the musical project of Dan Dukich, celebrates their latest album Depths of Height with a Tape Release/European tour kick-off show at Open Eye Figure Theatre. “I wanted to do this show at Open Eye Figure Theater instead of a traditional music space because Depths of Height is so heavily inspired by my work as a composer and sound designer in the Twin Cities theatre community,” says Dukich. Listeners may recognize Depths of Height’s closing track "Body's What I Want," which was originally penned for Open Eye's production The Clumsy Man, or recall title track Depths of Height from Dukich's composition in Theatre Novi Most’s production RANT. Minneapolis darlings P•PL lend their special blend of “freak funk” in support, while Sam the 7th Grader (Jay Eisenberg) performs Master of Ceremonies duties. This full-band Minneapolis show will kick off a month-long solo European tour for Daniel Bonespur, Dukich’s second this year. "Daniel Bonespur is a trip without ever sounding like anything but a sweetheart. A pitch-perfect voice with a wry perspective and fanciful sense of storytelling that builds on that of The Magnetic Fields’ Stephen Merritt." "Depths of Height is polychromatic dervish – mixing pop, lounge, and funk with unpredictable abandon."